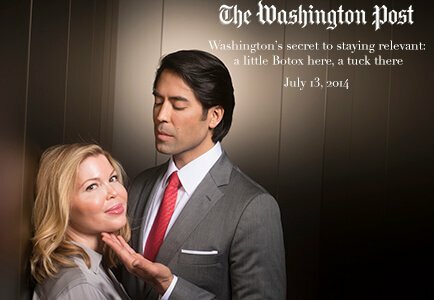 Ariel N. Rad, M.D., Ph.D. is Washington's facial rejuvenation doctor. As Assistant Professor and former Director of Aesthetic Plastic Surgery at Johns Hopkins, Dr. Rad brings his exceptional artistry, skill and aesthetic vision to Washington DC. A face lift, or rhytidectomy, is a surgical procedure designed to improve the visible signs of facial aging. There are many types of face lift techniques. However, the skill of the surgeon is the single most important factor. In Washington DC, our patients seek to restore a rested appearance with minimal down time. Particularly in Washington, Dr. Rad finds one of the most common reasons patients choose face lift surgery is to restore an appearance that reflects the bright and vibrant person they feel inside. Through careful planning, meticulous technique and exceptional care, Dr. Rad delivers impeccable results. STATS: According to the American Society of Aesthetic Plastic Surgery, in the United States approximately 133,000 face lifts were performed. While face lift is commonly thought to be reserved for later years, Dr. Rad treats men and women of all ages looking to maintain an appearance of slowed aging. Total cost depends on many factors: your unique anatomy, your goals and preferences, complexity of surgery, first-time or corrective work required, in-office (non-surgical) or hospital-based operating facility (surgical), and experience and skill of the surgeon. RECOVERY: Recovery can be just 24 hours for non-surgical in-office procedure. Dr. Rad uses the minimally invasive “closed” technique which allows patients rapid recovery and you can expect to return to normal activities in 7-10 days. With age comes experience and wisdom. However, we all want to be in control of how we present ourselves to the world. The goal of a face lift is not to smooth every crease or wrinkle, but rather to restore a rested and refreshed appearance. The most sophisticated work reveals the maximum version of one’s appearance, yet it goes unnoticed by the casual observer and does not induce speculation. Dr. Rad’s goal for each patient is to achieve this delicate balance. This 56 year old woman wanted improvement of loose neck and jowl skin and a tired appearance. Dr. Rad performed a total face lift, Short Incision Brow Lift, Open Neck Lift, Lower Blepharoplasty and Facial Fat Grafting. Dr. Sherber improved facial skin texture and pore size with a single Perméa Laser treatment. In Dr. Rad’s hands, and with Dr. Sherber’s maintenance treatments, results after face lift surgery last many years. This 65 year old woman wanted to restore her appearance to how she looked 15-20 years ago. She lamented how she used to have a bright and rested appearance and she wanted these features to be restored. Dr. Rad performed Canthopexy Eye Reshaping and Upper Blepharoplasty, Short Incision Brow Lift, Total Face Lift, Open Neck Lift, Lower Blepharoplasty + Fat Removal, and Facial Fat Grafting. This 51 year old woman felt that her face looked fatigued and sad. Dr. Rad performed Upper Blepharoplasty, Short Incision Brow Lift, Total Face Lift, Open Neck Lift and Facial Fat Grafting. This 63 year old woman’s primary concern was the loss of volume in her cheeks, severely wrinkled eye region, and blunted neck contour. Dr. Rad performed a total face lift, Open Neck Lift, Lower Blepharoplasty + Fat Removal, and Facial Fat Grafting. This 42 year old breast cancer survivor wanted to take the look of fatigue out of her eyes. Dr. Rad performed endoscopic brow lift, Open Neck Lift, Total Face Lift, Facial Fat Grafting, Upper Blepharoplasty, and Lower Bleph + Fat Removal. This 53 year old woman is a breast cancer survivor on whom Dr. Rad reconstructed her breasts with DIEP Flaps following her double mastectomy surgery. She felt that her 2 years of cancer treatment aged her facial appearance and she wanted to look refreshed. Dr. Rad performed Open Neck Lift, Total Face Lift, Short Incision Brow Lift, and Facial Fat Grafting. This 60 year old woman wanted to improve the profile of her nose by reducing the hump. She also desired total facial rejuvenation surgery. Dr. Rad performed closed rhinoplasty with Dorsal Hump Reduction, Open Neck Lift, SMAS Imbrication Face Lift, Facial Fat Grafting, Upper Blepharoplasty, Lower Bleph + Fat Removal. This 60 year old woman desired complete facial rejuvenation. She also wanted to improve flushing of her face, neck, and chest. Dr. Rad performed total face lift, Open Neck Lift, Lower Blepharoplasty + Fat Removal, and Facial Fat Grafting. Dr. Sherber treated dilated blood vessels and flushing on the face, neck, and chest with a series of Intense Pulsed Light combined with Nd:YAG. + WHY MIGHT I BENEFIT FROM A FACE LIFT? Everyone’s outlook on aging differs. Aging itself is not the problem as with age comes wisdom, experience and worldliness. However, we all want to be in control of how we present ourselves to the world. Particularly in Washington, Dr. Rad finds one of the most common reasons patients choose face lift surgery is to restore an appearance that reflects the bright and vibrant person they feel inside. Some patients whose work requires vigor and a youthful energy choose face lift to be perceived as still “relevant” in work, social circles and relationships. Wrinkles, drooping tissues and hollowed features often create dissonance with the vital inner self that has remained, if not strengthened, over time. Patients may feel disconcerted, with the onset of loosening neck tissues or under-eye bags, by their resemblance to an aged mother or father. Other patients leading a healthy lifestyle often find their aging, deflated faces to be out of sync with their fit and toned bodies. In Dr. Rad’s experience, the common thread running through each person’s decision is the desire to restore a vibrant outer appearance that reflects his/her vibrant inner self. While each patient’s reasons to have a face lift are varied and deeply personal, they are all valid. And when one feels self-confident in his or her personal appearance at any age, inevitably it has a positive effect on all aspects of life. + WHAT ARE THE GOALS OF FACE LIFT SURGERY? As facial tissues lose elasticity with age, sagging tissues can alter facial features and display unintended emotions. For example, patients often complain that they look fatigued, sad or angry when, quite the contrary, they feel positive emotions. Confidence and self-esteem can be deeply affected by these changes in appearance. While skin laxity and hollowing are generally the result of aging, these changes are accelerated by smoking, sun damage, dramatic weight loss, and illness. The goal of face lift surgery is not to smooth every crease, fold or wrinkle, but rather to restore a rested and refreshed appearance through subtle, targeted improvements that add up to a beautiful result. While a face lift does not stop aging, when done skillfully it can “rewind the clock” in one’s appearance. Ideal face lift work strikes a delicate balance: it reveals a different version of one’s appearance, yet it goes unnoticed by the casual observer and does not induce speculation. Dr. Rad’s goal for each patient is to achieve this balance. + WHAT ARE THE SIGNS OF AGING? Dr. Rad utilizes sophisticated techniques to target each of these anatomical changes to restore volume, restore contour and smooth harsh transitions throughout the face. Dr. Rad carefully assesses which techniques best address the anatomic areas of greatest concern and customizes a unique approach for each patient. + HOW DO I CHOOSE A PLASTIC SURGEON IN WASHINGTON DC? A plastic surgeon’s years of experience, number of face lift surgeries performed, aesthetic nuance, and certification by the American Board of Plastic Surgery are essential. Princeton and Duke educated, and Johns Hopkins trained, Dr. Rad has performed many hundreds of facial cosmetic surgeries. As Assistant Professor at Johns Hopkins Hospital, Dr. Rad directed the Aesthetic Surgery division wherein he taught residents (surgeons in training) advanced surgical face lifting. Known for his ability and vision, Dr. Rad’s face lift results are unparalleled and he often sees patients for corrective work after prior inexpertly performed lifts. Your safety is Dr. Rad’s highest priority. Complications arise when patients undergo anesthesia and surgery with untrained or inexperienced anesthetists, surgeons and staff. Dr. Rad operates in operating facilities at the top hospitals in DC and northern Virginia. Furthermore, he works solely with Board certified anesthesiologists and experienced surgical staff for the safest delivery of care. Achieving impeccable results requires careful planning, and Dr. Rad spends time with his patients and he customizes each patient’s surgery and plan of aftercare. + WHAT SHOULD I EXPECT IN MY CONSULTATION? In preparation for your consultation, Dr. Rad recommends bringing old photographs, from 10, 15 or 20 years ago. These are helpful to illustrate age-related changes to your facial anatomy and will facilitate discussion of how to restore your normal facial architecture. Patients require “medical clearance” from their primary care physicians (PCP) and possibly from specialists. Additional medical tests and blood work may be needed. Dr. Rad sees his patients another time prior to surgery, and he makes himself available to answer your questions after surgery, 7 days per week. + WHAT FACE LIFT TECHNIQUES ARE SUITABLE? the skill of the surgeon performing the lift is the most important factor: you’ll know when you’re in the right hands if your surgeon has the pedigree of training and ABPS certification, and s/he demonstrates thoughtful discussion, careful planning and aesthetic artistry. The use of a proven muscle-tightening (not skin-tightening) procedure: tension should be placed on the muscle layer (called the superficial musculo-aponeurotic system, “SMAS”), and minimal tension placed on the skin. Dr. Rad employs a “SMAS imbrication / platysma suspension” technique (read below). The bottom line is that Dr. Rad tailors his approach uniquely for each patient depending on many factors. This requires time with each patient to determine what combination of procedures will achieve a desired result while minimizing scars and down time. + HOW DOES DR. RAD PERFORM FACE LIFT SURGERY? Gone are the days of face lifts that tighten only the skin. Lifting and tightening the muscle layer, avoiding tension on the skin, and an eye towards proportion and symmetry are key to a natural result. Dr. Rad employs a “SMAS imbrication / platysma suspension” face lift technique which restores natural contours without an unnatural “pulled” look. Dr. Rad places scars in the most hidden locations along hairlines, inner aspects of the ear and tragus, and behind the ear. He gently elevates the skin to reveal the muscle layer which he tightens to sharpen the neck line, remove jowls, restore volume over the cheekbones, and define the jawline. Permanent sutures in the muscle layer are essential for a permanent result. Skin is gently re-draped over the tightened and lifted muscle layer, and the excess skin is trimmed. Incisions are hidden in the natural hills and valleys around the ear and along the hair line. Small drains are placed for 24 hours to remove fluid that otherwise might collect under the skin. Dr. Rad then places a dressing around the face and neck for gentle support. Combined with fractionated laser, patients can expect a youthful appearance and healthier skin without a pulled look in a matter of 2-3 weeks. A skincare regimen, comprised of products from the world’s elite skincare brands, is customized for your skin’s unique needs and helps to maintain your results for many years. + SHOULD OTHER PROCEDURES BE CONSIDERED WITH FACE LIFT? Since aging affects all areas of the face, Dr. Rad often performs eyelid lift, brow and forehead lift, and facial fat grafting at the same time as face lift surgery. Furthermore, emerging science Customized aesthetic dermatology care can delay the need for future surgical lifts, and can ‘protect your investment’ after surgery. + WHAT COMPLICATIONS CAN HAPPEN AFTER A FACE LIFT AND HOW ARE THEY AVOIDED? Surgery is very well tolerated and entails extremely low risk. Nonetheless, Dr. Rad takes every precaution to minimize risk. Rather than in a private office surgicenter which cannot handle potential, albeit rare, complications of anesthesia, Dr. Rad performs surgery at hospitals in DC and northern Virginia. Dr. Rad works only with Board certified anesthesiologists and experienced staff. This assures the lowest risk of complications. In Dr. Rad’s hands, the risk of injury from daily driving a car is much higher than the risks from surgery. Procedure-specific complications that are possible, albeit very uncommon when under skilled surgeons’ care, include hematoma (a blood collection under the skin), infection, nerve injury and delayed wound healing. However, these are not dangerous to patients’ health, and are rare to occur. Dr. Rad’s patients take comfort in a very low complication rate and, should a concern arise, that they will be guided every step of the way towards optimal healing and results. The most common difficulties Dr. Rad sees arise after face lift work by other surgeons. Patients whose skin is severely sun damaged and show extensive surface wrinkles are often erroneously treated by other surgeons with high-tension skin lifts in an effort to smooth wrinkles by pulling skin taut. This creates a ‘waxy,’ unnatural appearance with windswept, stretched features and odd facial and mouth movements. Dr. Rad often corrects these deformities with muscle-tightening face lift, and patients benefit from laser treatment to improve the skin’s texture, elasticity and skin tone, which invariably improves wrinkling without an unnatural, pulled look. For optimal results, face lift surgery and fractionated non-ablative laser (Clear+Brilliant laser) synergize. Dr. Rad often collaborates with his wife and Board certified dermatologist, Dr. Noëlle Sherber, to deliver such synergistic surgical and laser treatments thereby optimizing results. + HOW LONG CAN I EXPECT MY FACE LIFT TO LAST? Dr. Rad’s patients benefit from the experience of his wife, Dr. Sherber, a Board certified dermatologist in collagen biology. Dr. Sherber routinely advises and treats Dr. Rad’s face lift patients in order to maintain their results for many years. + WHAT ARE THE TELLTALE SIGNS OF A BAD OR OBVIOUS FACE LIFT? “pixie ear” deformity – too much skin tension pulls the earlobe downward, elongating it. + HOW DO I AVOID THESE PROBLEMS? Meticulous attention to detail and exquisite training, skill and artistry are the keys to impeccable results. Vet the surgeon based on education, training, ABPS certification and aesthetic results. Then, in consultation, ask the surgeon how s/he avoids these complications. The answers should be thorough and thoughtful with attention towards your particular care. Note: all medical records from outside offices should be requested by you. + CAN I COMBINE OTHER SURGERIES AT THE SAME TIME AS A FACE LIFT? Because a face lift addresses the neck and lower ⅔ of the face, Dr. Rad often performs other procedures at the same time as face lift such as facial fat grafting (to add volume to deflated and hollowed areas), eyelid lift surgery (for excess skin and under eye bags), brow and forehead lift, rhinoplasty, neck lift, and other minor procedures such as corrugator muscle weakening (“number 11 lines”), etc. A multi-procedure surgery is generally safe, it involves a single recovery period, and it is also more cost-effectiveness because the incremental cost of anesthesia, OR and surgery time decreases after the first hour. However, in-depth consultation with Dr. Rad is essential. + WHAT SHOULD I EXPECT FOR RECOVERY? Dr. Rad’s face lift patients routinely recover without significant pain. Mild to moderate discomfort is temporary and manifests as a feeling of tightness through the face and neck. However, this is expected, normal and temporary, as previously sagging tissues are lifted and tightened post-surgery. While the sensation of tightness subsides fully after a few weeks, your face lift result remain. If muscle is not tightened, as in a “skin only” face lift, then the lifted feeling and the result disappear quickly. Dr. Rad sees many patients for corrective work after skin-only face lifts performed by other surgeons. Therefore, a transient feeling of facial and neck tightness is a normal aspect of recovery and should not be feared. Recovery is as an outpatient. Social down time (the length of time you should plan off from work or social activities) lasts 2 to 3 weeks (depending on the approach and your unique healing process) after which most swelling has resolved and you can return to activities progressively. All prescriptions and pre-op instructions are provided in advance of surgery and your aftercare is carefully planned to ensure smooth recovery. + HOW DO I CHOOSE A SURGEON? Surgery can’t be reversed and it is challenging (but not impossible) to correct inexpert work. Patients should choose wisely. When choosing a plastic surgeon, ensure that s/he is certified by the American Board of Plastic Surgery. Education, training and credentials are essential: Princeton and Duke educated and Johns Hopkins trained, Dr. Ariel Rad is Assistant Professor and former Director of Aesthetic Surgery at Johns Hopkins where he instructed surgeons-in-training the nuanced and sophisticated techniques of face lifting. + HOW DO I SCHEDULE A CONSULTATION WITH DR. RAD? Contact us at [email protected] or 202.517.7299. We look forward to providing your care. My goal was to be a refreshed, happy, more confident version of “me.” As I prepared for surgery I had no unanswered questions and was totally confident about Dr. Rad’s skill and judgement. Interactions with Dr. Rad and his team at the time of surgery and follow up were efficient, and delivered with compassion and kindness. I recommend him without qualification. Two years ago, before I met Dr R, I had a mastectomy with the amazing team at Johns Hopkins. The cosmetic results were the stuff of dreams — MUCH better breasts than I had before! The overall experience was so fantastic that I asked my plastic surgeon to give me a face lift. He told me the best person to help me freshen up my looks was Dr R. Dr R listened to me really carefully at every step of the process, and gave me exactly what I wanted. He was attentive and really supportive, answering endless questions and giving me as much (or as little) explanation as I wanted. Like the other doctors I’ve known at Hopkins, he’s not just a great doctor but also a real person, with good people-skills and a commitment to his patients. He made me feel beautiful. My breast cancer days are behind me. I have a whole new lease on life, and a whole new healthy and fresh look as I head into my future. I can’t recommend him highly enough. Dr. Rad is a supremely skilled surgeon, his surgical ability is God-given! Dr Rad is a doctor you can put your trust in, which is hard to find nowdays. If ever there were a reason to believe there are people on this earth doing what they were meant to do, Dr. Ariel Rad is one. He brought a whole new meaning to the word hope and excellence. His surgical skills and personal demeanor are beyond comparison. Dr. Rad’s approach is unique for each patient, and it combines sophisticated, state-of-the-art techniques to achieve natural and long lasting results.